The “Grammar + Editing Handbook for New EWM Majors” is a project designed for Josh Mehler’s Advanced Writing and Editing class, an elective course in the Editing, Writing, and Media major. The purpose of this assignment is to help familiarize students with elements of grammar and punctuation while simultaneously giving them experience researching, writing, and editing a large, class-wide collaborative writing project. Further, this project is specifically targeted to an audience of new EWM majors and ultimately aims to support incoming students as they begin their studies in EWM. To view Josh’s assignment sheet, click here. Composed in Rory Lee’s WEPO (Writing and Editing in Print and Online), Heather’s expository piece was developed this piece using movie clips, an Edmund Burke Quote, and a handful of researched information about the genocide in Darfur. Heather’s composition communicates a powerful message about the enduring scars of genocide, scars that persist long after the next news cycle. “Florida State Create” was created as a part of Rory Lee’s WEPO course — Writing and Editing in Print and Online. This particular project was part of a viral marketing campaign project. To complete the viral marketing project, students create a constellation of texts that address one subject. What is interesting about Florida State Create is that it includes a diverse range of creative projects: art, photography, writing, and music. Florida State Create is currently taking submissions for student works. The projects in this collection were developed in Rory Lee’s Rhetoric course (ENC 3021). Rory asks his students to develop a digital work that communicates the key terms and ideas developed by the sophists, Aristotle, and Plato. As is the case in his epistemology projects, Rory does not ask his students to use a particular medium or composing platform. The projects included here were composed with Wix (a web-building platform), Tumblr (a social media platform), and InDesign (a desktop publisher). The projects in this collection were developed in Rory Lee’s Rhetoric course (ENC 3021). Rory asks his students to develop a digital work that explores the epistemology — way of knowing — of a specific author included in Rhetoric’s canon. The projects included here explore the epistemologies of Kenneth Burke’s, Francis Bacon’s, and Gloria Anzaldua’s theories of language, knowledge-making, and motive. Although the Williams Digital Studio does offer student consultation with their digital projects, that is not the Studio’s only function. In addition to serving students, the Digital Studio also provides resources and support for faculty and graduate student research. 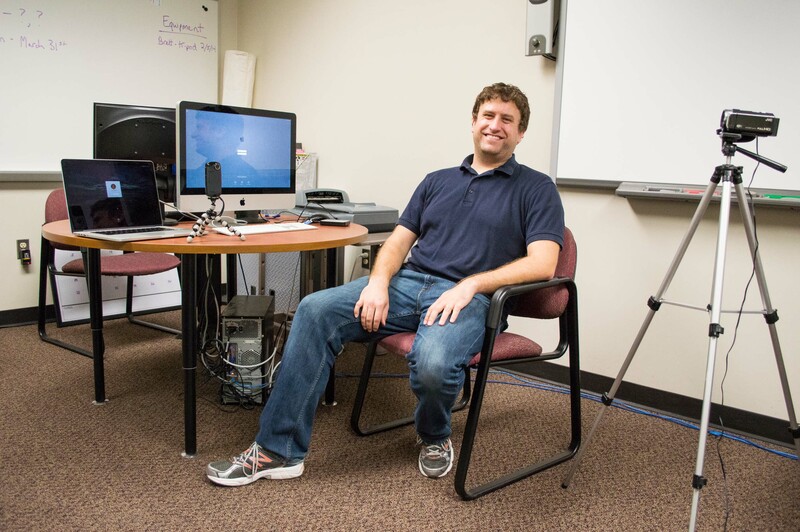 Bret’s dissertation project is a vivid example of Digital Studio-supported research. Throughout the Spring 2014 semester, I have been using the FSU Digital Studio as the site for my dissertation research on knowledge transfer and materiality. I’ve been most interested in identifying connections between individuals’ tacit and explicit knowledge of the material affordances provided by the space in which they compose and the limitations of genre and media. It’s been a challenging process getting the protocols scheduled and set up, but the Studio has provided the perfect space, with available resources to help students compose on and off the screen, supporting the many diverse ways of approaching multimodal composing. The eventual goal of my research is to articulate a better understanding of how material awareness influences the composing processes that students engage with when they compose across the contexts of print, screen, and network. Using the Mac and PC workstations along with the recording tools available in the Studio, I’ve been recording student think-aloud protocols as students work on completing remediation assignments for ENC3416: Writing and Editing in Print and Online, paying close attention to the tools, technologies, and strategies they use while writing. Using a multi-camera setup and screen recording technology, I’ve gotten to watch students work on some very smart projects and observe their writing processes in depth. Jenna composed her portfolio for Joe Cirio’s ENC 1102. Jenna’s portfolio is a nice example of coherence between a portfolio’s theme and the texts that she included. Her theme — quilting — is an interesting way of communicating how she understood the process of selecting, arranging, and reflecting on her work. Her “My Journal Entries” page is a particularly nice enactment of her quilting metaphor. In the tradition of the published course journal, Heather Lang and Bruce Bowles Jr. have published their students’ work online as part of their class’s coursework. These showcases provide a unique, contextualized insight into students’ work, and in this case, that work takes the form of multimedia and multimodal projects. Heather’s “Writing about Public Service and Community Change” showcase includes relevant materials (her syllabus and assignment sheets) with a collection of collaborative portfolios. Bruce’s showcase of student work is a selection of individual works that span across the course of the semester. In his note on the frontpage of the showcase, Bruce emphasizes the idea that the sum total of these project cover a range of sports and sports events. David’s “Lolcats and Writing” is a project he developed to teach students about rhetorical circulation and transformation. In this digital text, David provides definition of concepts, a pedagogical rationale, and the assignment sequence. Joe developed this assignment as an entry in the 21st Century Literacies Lecture Series. Joe’s assignment asks students to use the social media site Vine as a composing platform. In asking his students to use Vine, Joe hopes to bring together everyday literacies – mediation and remediation – and school-based literacies – critical literacy and critical reflection. David’s “Rhetowriters” is both an online syllabus and a space where his students maintained blogs and contributed to wikis. Developed using Drupal, David’s course site is an example of viable option for those teachers who resist using platforms like Blackboard to administrate their course. Teachdock is a searchable database designed to complement FSU’s Inkwell and the McCrimmon Award archives. Unlike those spaces, Teachdock does not have an editorial board, and it does have a comment function. For more information about Teachdock, visit the site’s about page. Because of privacy concerns, the site is password protected. You will need to make a username and password with a @my.fsu.edu or a @fsu.edu account. The three digital texts showcased here come from three different courses and were composed for different occasions. Joe and Erin’s “Writing Assessment” Wikipedia article was created as an assigned project for Kathleen Yancey’s “The Digital Revolution and Convergence Culture.” As a demonstration of public intellectual work, Joe’s and Erin’s article draws from Writing Assessment research to contribute their field’s point of view to a contested topic in the public’s discourse. To support Dr. Yancey’s course, Jacob Craig, a Williams Digital Studio consultant, held a workshop about writing, editing, and coding Wikipedia articles. A link to the handout is included below. Erin’s Writing Assessment portfolio was developed as a final project for Michael Neal’s “Writing Assessment and Technology.” Like her’s and Joe’s Wikipedia article, Erin’s portfolio draws from writing assessment research and theory to articulate theory of assessment and the application of that theory into a set of practices. David’s meme map – also composed for Dr. Yancey’s “The Digital Revolution and Convergence Culture” – maps the historical development of the meme. His project is based on John Paull’s theory of the meme’s lifecycle. David’s meme map is part of a larger interest in memes as a way to teach rhetorical circulation. The three texts included in this section — a book chapter, a digital archive, and a journal article — speak to different aspects of digital scholarship. Namely, each text is an interesting enactment of what we mean when we say digital scholarship. This particular sample suggests that digital scholarship can mean combinations of the following activities: digital publishing, theorizing digital practices, digital methodologies, and digital composing. Included in Digital Writing, a book published through the Computers and Composition Digital Press, Kathleen Blake Yancey, Stephen J.
produced and viewed/read. Much of the PDF version of the chapter was produced in the Digital Studio. The FSU Digital Postcard Archive is a long-term project here at FSU. 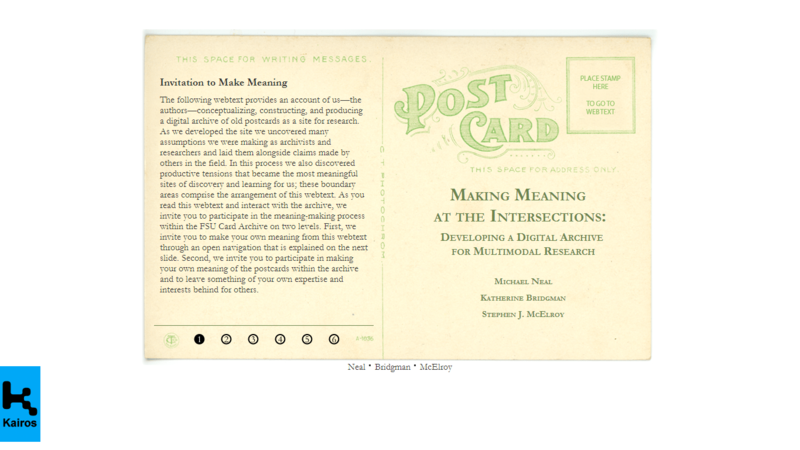 This project has engaged faculty, graduate students, and undergraduate students in several activities: acquiring postcards; scanning, uploading, and coding postcards along the standards of the Dublin Core; developing exhibits; and writing about their work. While the archive is administrated by Michael Neal and doctoral students Katie Bridgman and Stephen McElroy, a number of undergraduate graduate interns have also worked on the archive. They are showcased here. As part of this project, Michael, Stephen, and Katie are also sharing their efforts at various conferences and in publications. One of those publication is the Kairos article. Through this article, Neal, Bridgman, and McElroy discuss the conception, construction, and production of the FSU Card Archive. In recent years, several FSU instructors have incorporated Twitter into their classroom. The visual below represents hashtags that are currently active in the Department of English’s courses. 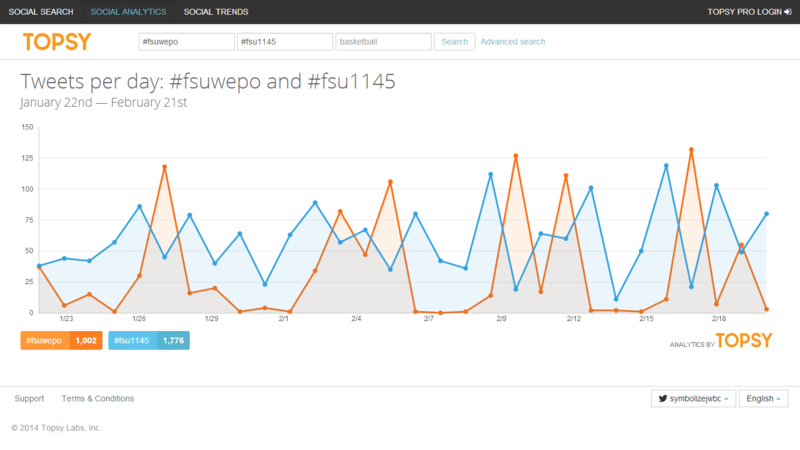 Referring to the chart above, the blue line represents #fsu1145‘s activity on Twitter, and the red line represents #fsuwepo‘s Twitter activity. As part of a larger pedagogical strategy referred to as #teachwithtwitter, this teaching strategy has two goals. #teachwithtwitter seeks to bridge students’ existing and developing literacies, and  #teachwithtwitter fosters a community of collaboration and participation both inside and outside the classroom. This example of a #teachwithtwitter pedagogy comes from Molly Daniel’s WEPO course. Tweets were compiled and arranged with the Storify platform. These professional portfolios were created in Rory Lee’s section of WEPO: Writing and Editing in Print and Online. This assignment, the last in a sequence of four, asked students to design a digital portfolio for the purpose of representing themselves as a job candidate. To prepare students to develop their portfolios, Rory has developed a scaffolded sequence of exercises. First, students reviewed other portfolios available online. More specifically, he asks students to look at design and the selection of materials. Then to design their portfolios, students researched potential future employers understand and meet the expectations of specific prospective applicants. Along the same lines as the undergraduate professional portfolio, the graduate portfolio attends to an audience and a purpose whether that audience be a PhD admissions committee or a job search committee. More than a collection of documents – teaching philosophies, research statements, and vitaes – the graduate portfolio is a visual and verbal expression of the candidate’s experiences, theories, and goals for the future. All work showcased here was obtained with expressed written permission from the contributor(s). For more information about the event or this showcase, contact fsucwc AT gmail DOT com.